A season ends. A roster changes. Every year, it happens. On Monday, those moves started to play out. Jay Simpson, Richie Marquez, Fabian Herbers, Marcus Epps, Josh Yaro, Adam Najem and Jake McGuire are out. Borek Dockal wants to return to Europe now that his loan has expired, according to Union sporting director Ernst Tanner. John McCarthy wants to compete for a starting job somewhere else. Some variables have yet to play out, but for the most part, the chess board has become pretty clear for the Union. 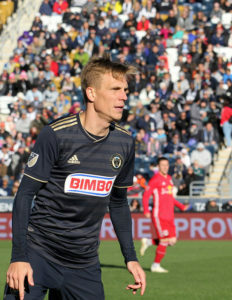 The Union declined contract options on seven players, the team announced Monday. None were surprises given how this season played out, but some were key players — or projected to be — in the not too distant past. 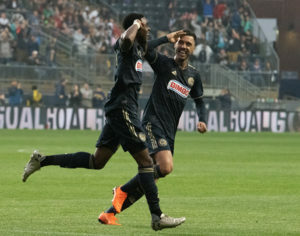 After getting injured while scoring his first goal for the Union last year, Simpson went 18 months without scoring another one and never won back the starting striker job he held when the 2017 season started. This one almost had a surprise happy ending, with Simpson winning MLS Player of the Week after two big games in perhaps one of the most improbable wins in Union history. But it wasn’t to be. His departure clears $623,341 from the salary budget, the fourth highest cap hit on the Union. Not long ago, Marquez looked like one of the league’s better center backs, with good size and recovery speed almost unmatched around MLS. Another MLS club would be wise to pick him up, because he’s a proven starter in MLS. Herbers played striker in college, but he rarely did for the Union, instead moving out to the right wing. In that latter role, he had a very good rookie season, but injuries repeatedly blocked his progress and he failed to improve. Meanwhile, he looked sneakily good for Bethlehem in rare time as a striker. A departure is best for Herbers. He needs to find a team and a system that can better take advantage of his skill set. It wouldn’t surprise me if he latches on somewhere to play striker (even in USL or a lower division in Europe), scores a ton of goals, and finds himself a significant player again. Of the departures, this one simultaneously surprises the most and doesn’t surprise at all. On one hand, Epps clearly didn’t impress Jim Curtin enough after playing fantastically in his first start this year and then never denting the scoresheet again. Once he lost that starting spot, he was basically done for the Union. The Union should have traded Yaro a long time ago, when he still had value. It is a failure of MLS scouting and a sign of massive group think that anyone thought a slightly built center back who stands only about 5-9 (regardless of what he’s listed at) was the best MLS prospect in any given year. It is without question that Yaro is a talented player, but he took a beating at center back, in part because he wasn’t big enough or strong enough for the role. If concussions and other injuries haven’t ended his career, here’s to hoping that someone signs him with plans to try him in defensive midfield or at the right side of a three-man back line. Najem never really got a shot in MLS play, and it was never fully clear why. He played well last year for Bethlehem Steel, but this year, he got marginalized in favor of other players the Union clearly want to see break through to the first team. He’s a creative tweener with some talent and passing vision. It will be interesting to see where he ends up. McGuire did a good enough job to backstop Bethlehem to a playoff spot, but not enough to prove he will be MLS material. Expect him to latch on as a starter with another USL team next year, with hopes to continue progressing. The veteran is out of contract, and the Union have not indicated plans to resign him. With Olivier Mbaizo showing a ton of potential so far at right back behind Keegan Rosenberry and Matt Real to be given every chance to win the left back job, it might mean Gaddis departs. That’s risky, given Real hasn’t won the job yet, but it’s easy to see why a sporting director looking at the roster would cut Gaddis from it. He’s never been a real left back, just a guy who holds down the fort until one shows up, and there are two other good right backs on the roster. Tanner said Creavalle has a contract offer from elsewhere, but where? He’s a role player, no more. It’s not like Europe will come beckoning. Is he looking to start for a USL side? 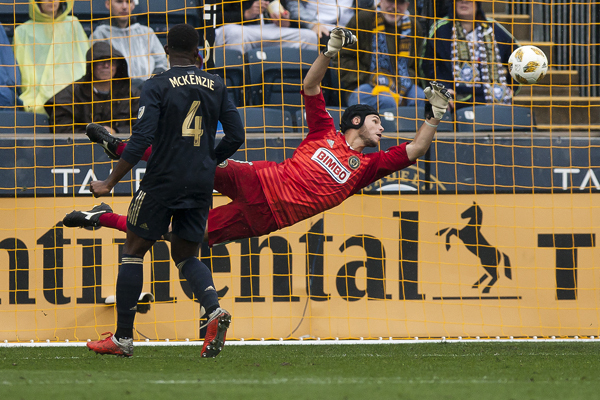 Creavalle played a useful role for the Union this year as a reserve No. 6 and late game defensive sub. The Brazilian left back is also out of contract, but the Union have indicated talks to bring him back at a lesser salary. Given the Union’s roster moves and Monday’s comments by sporting director Ernst Tanner, their personnel needs have become pretty clear. No. 10: Dockal’s loan has expired, and he has told the Union he would like to return to Europe. Prospects for his return to Philadelphia don’t look good. His loss is a crushing one, and the Union must replace him or get lucky and find a way to bring him back. Striker: Tanner said Monday that the Union would like to add a quality striker who can improve hold-up play and, we presume, score more goals. Cory Burke scored this season but didn’t offer much in hold-up. C.J. Sapong offers good hold-up and defense but lost his scoring touch and confidence this year. Veteran backup center back: The Union have three good center backs, all MLS starter quality, age 23 or younger. They need a veteran among them who help elevate their play, someone like an Oguchi Onyewu or Bobby Boswell who can push them and show them the way. Unfortunately, guys like that aren’t easy to find as a fourth center back. Answer the question at right winger: Will it be David Accam? Will Ilsinho get fit? Will they find a left-footed inverted winger? Will a significant default formation change drastically changes how this position plays? That last question determines all the rest. Midfield depth: Herbers and Epps are gone. Creavalle may be too. Neither Anthony Fontana or Brenden Aaronson has yet won a regular spot in the rotation. They need a reliable name here. Left back: They won’t be signing one. The job is Matt Real’s to win or lose in training camp. All that said, plenty of variables abound. Let’s start with the biggest one. Dockal has made clear he does not want to return to Henan Jianye, the Chinese team that holds his rights, instead preferring a return home to the Czech Republic, probably Prague. That said, there’s still a chance the Union could retain him. A 30-year-old attacker isn’t going to earn a big transfer fee anywhere, so Henan ought not hold their breath on this front. Czech teams aren’t exactly doling out big purchase fees either. A decent offer by the Union could bring his rights again. Dockal clearly enjoyed his time in Philadelphia this season. If a Czech team can’t pay what’s required, maybe Philadelphia could, and they should try. He was fantastic this season, the key to their attack. There’s nothing wrong with the Union being second choice if the result is that Dockal returns and plays like he did this season. Will Matt Real win the starting left back job? Last year, the Union entered the off-season with, in retrospect, clear plans to give Auston Trusty every opportunity to win the starting left center back job. Unless he blew it, the job was his. Expect Real to get the same opportunity next season. Real played well for Bethlehem this year and is captaining the U.S. U-20 National Team. In his three starts for Philadelphia this season, he showed a classic mix of great potential and youthful inexperience. He has good technical ability, sends in solid crosses on the overlap, plays decent defense, and is actually left-footed. He should improve with time, effort, and focus. The fallback options will, again, be a mix of Ray Gaddis and Fabinho. That’s not a combination you should want to enter the season relying on as your starter, but given Real’s prospects, it’s a logical, cost-effective move. Real has to make the leap. One of the most intriguing things to come out of Monday’s end-of-season news conference by Curtin and Tanner was Tanner’s rebuke of formational and tactical dogmatism evinced by the Union during Earnie Stewart’s tenure as his predecessor. That’s welcome, because it made the Union predictable and inflexible, but it poses some questions given how good the Union looked from May through October in a 4-3-3. If you gave them a big-time striker, what could they have done? The Union’s tactical plans will drive their off-season shopping and pose some questions. If Fafa Picault is to be more of a forward, what does this team look like? Is he a second striker, with Alejandro Bedoya and Haris Medunjanin behind him? Does that mean the Union need a traditional left-footed left winger? Where does that leave David Accam? Will we see a 3-5-2? Could the Union play this formation in in 2019? The Union have three very good young center backs. Trusty and Mark McKenzie both have the speed to play the wider slots. McKenzie isn’t as strong in the air, but he has the ball skills and passing eye to move farther up field. Jack Elliott has the height, smarts, and passing vision to be perfect in the middle, and having two center backs flanking him could mask his lack of foot speed. 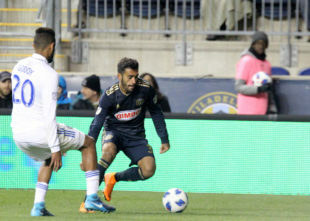 The Union would need to add two more center backs, rather than one, but Bethlehem defender Matt Maloney may project better as a right-sided center back in a three-man back line than either a fullback or straight center back. Three center backs protect a deep-lying playmaker weak on defense. Haris Medunjanin isn’t getting younger, but he can still pass a ball and maintain possession in traffic as well as anyone in the league. Keegan Rosenberry and Matt Real project well as wingbacks. We already know how good Rosenberry is in the possession game. With a spare center back behind him, this could be the role he was born to play. Real could project nicely as well, and it’s a good fit for Fabinho as a reserve. Meanwhile, Ilsinho can also play the wingback role (or the free-floating Picault role), but that could tax his fitness even more than an attacking midfield role. Olivier Mbaizo looks like a freakishly good athlete who would press for time in this system. Picault as the second striker. Given a free role, Picault could be awfully dangerous. Picture him (or David Accam) free to float wide to either wing, much like Fabian Espindola used to do for Salt Lake, or running off the shoulder of a target forward closer to the center of the field. They’d still need a No. 10. No answers here just yet, but maybe this sort of role in a 3-5-2 suits Fontana better than a role as the primary creative playmaker. The Union only have a few players likely to be bandied about on the trade market. Jack Elliott: If the Union like the notion of a 3-5-2, then he isn’t going anywhere. If they don’t, then they have one too many starters, all of whom have great trade value. The homegrowns aren’t leaving, so that puts the spotlight on Elliott. David Accam: Accam’s trade value has bottomed out due to his catastrophic 2017 season, the injury that ended it, and his high salary. A trade won’t get anywhere near the allocation money haul he cost the Union. So either they dump him and eat the loss, or they give him another try. Expect the latter. John McCarthy: The 26-year-old local product has indicated he wants an opportunity to compete for a starting goalkeeper job somewhere. That presumably means a trade of his rights or allowing him to leave in the expansion draft if Cincinnati wants him. McCarthy has shown he has what it takes to legitimately challenge for a starting job somewhere, but he might want to consider some patience, as an Andre Blake departure to Europe always seems just around the corner. No one else is likely to move via trade. C.J. Sapong is unlikely to have high value around the league at this point. Derrick Jones has yet to break through as a starter, but he might get more chances in a 3-5-2. Either McCarthy, Sapong or Accam will likely be dangled in the expansion draft. If it’s Accam, he’s a tantalizing prospect for Cincinnati who would be difficult to pass up. It would free a huge chunk of salary for the Union, but it would also net them next to nothing back for the $1 million-plus in allocation money they dropped on him. If it’s McCarthy, it’s because the Union want to give him a chance to compete for a starting job. Don’t be surprised if the Union make McCarthy a bonafide offer so they can hold his rights to trade him, or if they simply trade him to Cincinnati in lieu of an expansion draft selection. Ernst Tanner has no track record for player moves in MLS, but he has demonstrated smarts on this front while in Germany. He is the biggest variable. The Union have one of the league’s lowest payrolls, and you should expect that to continue. It’s not a variable, unfortunately. The biggest priority is replacing Dockal at the No. 10. You don’t typically find a guy like that without paying a transfer fee. Yes, the two most expensive positions on the field. Tanner has some big tasks at hand. I don’t want to see Fabinho or Gaddis on this team anymore. If Real doesn’t win the job, or gets hurt, we still need a new LB. Are there any older/veteran LBs out there (in free agency or the waiver draft) who can be a (very) short term stop gap, but would also project well to being a backup when Real is ready to play? Fabi could also be better at wingback than fullback since wingback lessens his defensive responsibilities and gives him more latitude to bomb down the field. Still rather see Real in that role but think Fabi would be solid back-up. Doesn’t a 3-5-2 usually have at least one midfielder that is is strong at being a central shield for the back 3? Not Medunjanin’s strength and not sure it is a role we want Bedoya providing. I like the idea of 3-5-2 with our 3 young backs and a lot of speed/talent on the wings, but then it is time to trade Medunjanin and let Jones be the bottom of the midfield triangle – if he’s ready. I still think trading Blake would make sense. His value won’t ever be higher. Well, that’s an intriguing idea. Not sure it sends a good message to the rest of the team though. Replace Dockal with equal or better player. they had the same challenge 3 years ago when Barnetta left and failed for 2 years . took them 2 years to fill that void. expect a step backwards if they don’t meet this challenge. Dump Sapong Accam and Simpson and finally get a quality proven hold up Forward. Came close for only 1 good season with Connor Casey and Alejandro Moreno season 1. A left fullback who can initiate an attack on the left and plays solid defense. Never had this guy. Never a big concern for any Union coach. They treat this position with no respect. their misjudgment. Getting Ilsinio in better form, Sorry Ernst I like him but he is not going to get heathier in the second half of his 30s. Just pray he does not have a serious injury. Getting Harris to get back quicker on defense again folks that ship has sailed Union fans. expect teams to exploit him all year. Hoping Mckenzie and Trusty can continue to get better. Marquez got unlucky with his injury but his development was stifled by Curtin. got the feeling He will come back to haunt Philly. If there is one one out there who follows the latest tactical trends in the Bundesliga, please,enlighten us what they are. It is essential data for trying to read Herr Tanner’s mind. If you’re looking for insight into Ernst’s thinking, the Bundesliga is a good place to start. There is a recent trend (last 3 -4 years) of more teams lining up in a 3 back system such as proposed here. This is coming from the new generation of coaches being produced at the prestigious Hannes Weisweiler Academy, all of whom are under 40 or in their early 40’s (sounds like Jim Curtin). Some of the notables are Julian Nagelsman at Hoffeneheim (where Tanner was once sporting director); Domenico Tedesco at Schalke; Hannes Drews at Ezgerbirge AUE (Bundesliga 2); Markus Weinzierl at Stuttgart; and Adi Hutter at Eintracht Frankfurt – all of these teams have been playing in a 3-5-2 system with either a traditional withdrawn defensive midfielder or an advanced playmaking midfielder (more like a 3-4-1-2). But every one of these teams feature a very high press, which seeks to win the ball back in the opponents half – often near the 18. Interestingly, where Ernst last worked, RB Salzburg in the Austrian Bundesliga, they feature a hybrid of this system under Marco Rose which is now also coming into vogue in the German Bundesliga. Teams that feature this hybrid system are Dusseldorf under Freidhelm Funkel; FSV Mainz under Sandro Schwarz; and Wolfsburg under Bruno Labbadia. All of these teams press very high with a front three as they set up in a 4-3-1-2 or narrow 4-4-2 Diamond. However, depending on what side of the pitch the ball is on at the time, the right or left fullbacks push so far into the midfield in the attacking phase (with all other defenders shifting over) that it essentially becomes a 3-4-1-2. The interesting thing is if the Union are taking the latter approach, i.e. 3-4-1-2, most of these teams do not feature a true, bona-fide #10 behind the strikers. Ernst’s previous two employers are the most notable – RB Salzburg and Hoffenheim – as both use this position as a false “9”. In Salzburg’s case the position is usually manned by the Japanese player Minamino who is more of a striker than playmaker and Hoffenheim usually line Croatia’s Andre Kramarich in this spot. They are not playmakers like Dockal per say, but more like withdrawn forwards. 1. I still think we should move on from Medunjanin and let Derrick Jones take that spot. But it does become less important to have a destroyer in that spot with 3 CBs. 2. Assuming we have a good #10 — whether it’s Dockal or a new signing — it would not surprise me to see Sapong, who would be Burke’s backup in this setup, thrive as the #2 forward. 3. Likewise, I wonder if Accam, who would be Picault’s backup in this scenario, might have a way better season in this setup. 4. The odd-man out here would be Ilsinho, who simply does not fit in any of these roles. Given that Tanner is interested in tactical flexibility (THANK GOD), I think he’d only play if we switched to a different formation. Gaddis should stay. If only for depth. They know he really won’t hurt them. And he is a solid defender. If they can get good value for him that’s an option. But he’s a team player and not a big risk to keep! Sorry to see some of the other guys go who had rough seasons. But that’s the MLS. Good luck gentlemen! May you find success elsewhere!